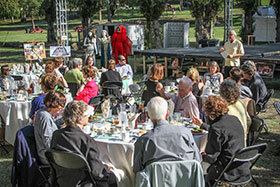 Kingsmen Shakespeare Company invites you to a special outdoor benefit dinner on Sunday, June 8th at Kingsmen Park. The exclusive event will feature a sneak peek at the rehearsal process and a scene from the upcoming production of Twelfth Night, a stage combat experience, and much more. During the reception hour, you can bid on one of their many “Baskets for the Bard” in the silent auction, and view costume renderings and stage models. Then enjoy a sit-down dinner during the evening’s program. KSC will also present the 2nd Annual Lord Strange Award to Susan Streeter at the event. Similar to Shakespeare’s first patron namesake, Lord Strange, Susan was one of the earliest patrons of the Kingsmen Shakespeare Company. She has served as business manager, patron, volunteer, Honorary Board Member, and regular Festival attendee. She and her late husband and KSC Board President Jarvis, have hosted numerous Kingsmen events and have always led the charge when volunteers were needed. Tickets are $75 per person and limited seating is available. Summer casual attire is suggested, along with a light jacket or wrap for after sundown. Sunday, June 8, 2014, 4:00 – 7:00 pm at Kingsmen Park – seating around the stage. For more information and to purchase tickets, go to www.kingsmenshakespeare.org/benefit.